Just attended the P1 Malaysia Ebay Preview, full of useful information, tips and few inspiring ebay seller story. Thank to the great effort of P1 Wimax and Ebay to conduct this training. 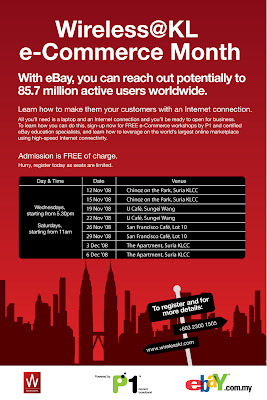 Beside that they are giving out free Ebay basic training which cost RM300 for the attendees. For those who are interested can leave a comment here with your email. I will email you with the details to obtain the selected free basic training.